The Transcontinental business week finished with students meeting and networking in New York City. The event was a great opportunity for students and alumni to exchange ideas and experiences. « The Transcontinental Business Week was a rewarding event for all of us. 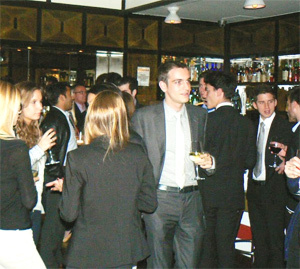 With 40 people attending the event at the "La Soffitta" bar in New York City, we were able to exchange with graduates who have settled in the Big Apple. This reception gave us the chance to talk informally with alumni about their academic backgrounds and their jobs. It was a great opportunity to learn about new possibilities as alumni shared their experiences and gave us advice on the U.S. labor market. In addition, we were invited to visit the companies' of several alumni during the week. The highlight of the week was meeting professionals with such diverse profiles (from bankers to project managers to software developers) and presenting our career projects and initiatives to them. It was a real chance to gain valuable feedback and develop opportunities for the future.